If you don’t know how to create your own vegetable garden, or perhaps lack the time or energy, let us help you on the road to healthier food. We will give you that push to help you on your way to enjoying the pleasure of harvesting your own healthy vegetables, comforted in the knowledge that they’re fresh and organic, whether herbs, summer salads or winter roots. We offer a complete service so that you are ready and prepared to look after your garden, producing you own healthy, organic and fresh crops on your terrace, patio or in the garden. Furthermore, in Barcelona and its surrounding area, thanks to the wonderful coastal climate, we can grow food all year round, so you always have something delicious and healthy on the table. We can install various styles of organic vegetable garden according to your preferences and the space you have available, either on a balcony, terrace, patio or in the garden. 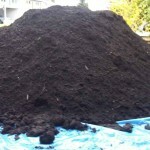 Our service leaves your vegetable garden completely ready so you only have to think about the recipes. In addition, we can help with seasonal jobs and with weekly or monthly control visits that include: weeding, planting and plant health inspection. On balconies there’s usually limited space and so a little creativity is required to ensure you get maximum benefit. 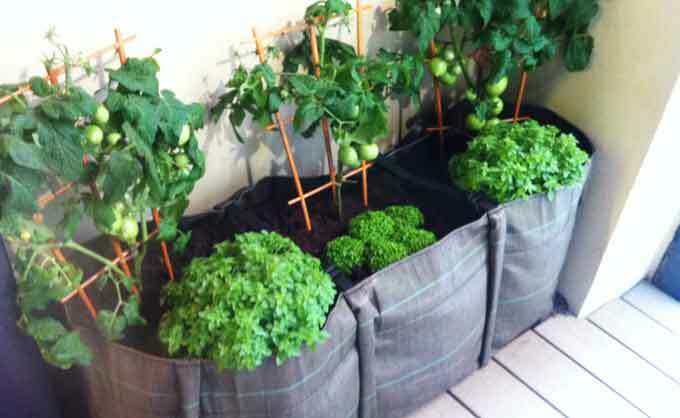 Whether its a vertical garden, a low lying raised planter or some Bacsac textile planters we’ll find a a solution to ensure you can grow your favourite vegetables. 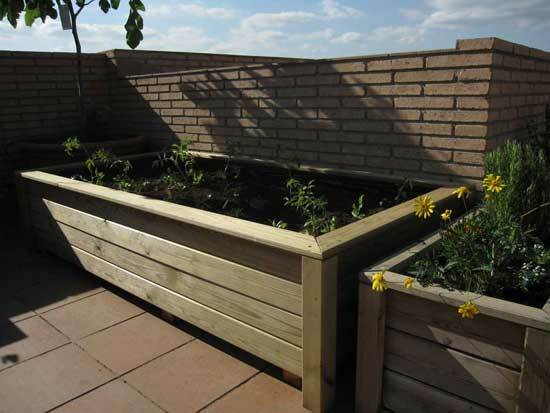 With more space the options increase, and we could install raised planters, either prefabricated or our own made-to-measure examples, as well as many other possibilities. This ensures a high output and can easily provide a financial saving in the medium-term, as well as hours of fun cultivating and of course eating your crops! We can convert your patio into an oasis of green. Whether large or small, using raised beds, plant pots or cultuvation tables we can ensure you have vegetable for the table on a regular basis. 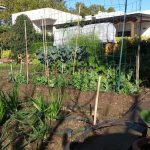 A vegetable garden will complement the ornamental plants you already have, or just as easily become the protagonist of the space. Infrequently found in the city, but nevertheless, we have installed gardens on community land and private land, people who wish to take advantage of the space they have. 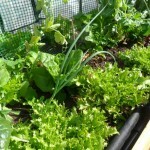 With good planning, an urban vegetable garden could provide a good yield of crops throughout the year. You can choose open field cultivation system with raised beds dug directly from the soil, planters or our own raised beds built to size. Write to us or call us for more information.